One week after Donald Trump won the presidency, he is running his transition the way he ran his campaign, like a neophyte circus ringmaster who walks into the center ring with absolutely no idea of what to do next. The clowns are bolting from their small crowded car, the acrobats are swinging high from their wires. The elephants are standing by quietly, perhaps recalling the plains of Africa. Lurking over in the far edge of that circus ring is a mysterious figure, maybe a lion, or maybe another being, hungry for power. It is not a presence we expected to see at this circus. The audience pays him no attention. What about that audience? It is now living with the consequences of the second presidential election in 16 years in which voters gave the popular vote victory to the loser of the Electoral College race, the one that counts. The audience mourns or is gleeful. Some, but sadly not all, watch and read to see what happens next. In Washington, The Los Angeles Times reports President Obama held the traditional courtesy talk with his successor, reporting later he tried to point Trump in the direction of pragmatism. The president-elect’s new Capitol Hill colleagues try to pull him in a “more ideologically conservative direction”. Ideology versus pragmatism is a common tension with any new president. Donald J. Trump is however, not cut from the pattern of previous presidents. He is, without question, the most unqualified candidate ever to assume the office of President. He has, throughout his improbable campaign, demonstrated in public and in recorded private conversations, that he lacks the temperament and the maturity to become president. But Donald Trump will become our President on Inauguration Day, January 20, 2017, just nine weeks from now. The transition to a new administration is launched in chaos and circus-like disarray. Suddenly, from the chaos of the transition, comes the news that brings a disturbing clarity to the future. 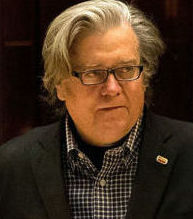 On Sunday, November 13, Trump named Stephen Bannon (pictured above) as his chief White House strategist and senior counselor. Trump also named Republican National Committee Chairman Reince Priebus as his Chief of Staff. How close will Bannon be to the President? David Alexrod held the Bannon job through the first Obama term and in both Obama presidential campaigns. Chicago’s current Mayor Rahm Emanuel, was Obama’s first Chief of Staff. That close. Bannon will be the door-keeper for the President. How he thinks and what he feels, will shape the White House agenda. Trump’s first transition decision is a signal for what we should expect from a Trump White House. Anyone holding out hope that Donald Trump would govern as a uniter — that the racism, sexism, anti-Semitism and nativism of his campaign were just poses to pick up votes — should think again. In an ominous sign of what the Trump presidency will actually look like, the president-elect on Sunday appointed Stephen Bannon as his chief White House strategist and senior counselor, an enormously influential post. The press release from the Trump transition staff said that Bannon and Priebus would be “equal partners.” This is a signal to Washington that Bannon will be the most powerful person in Trump’s White House. On November 6, 2008, the day after his election, Barack Obama made just one personnel announcement: that Congressman Rahm Emanuel would be his chief of staff. Every staff member in the Obama White House reported to Emanuel, including political advisers such as David Axelrod. The SPLC has monitored hate groups from its Montgomery, Alabama headquarters since it was launched in 1971 by Morris Dees, an advisor to the 1972 George McGovern campaign. Bannon does not deny his SPLC description, the Times reports, “telling Mother Jones last summer that Breitbart was now the platform for the alt-right”. The “alt-right”, the Times elaborates, is “a loosely organized group of mostly young men who believe in white supremacy; oppose immigration, feminism and multiculturalism; and delight in harassing Jews, Muslims and other vulnerable groups by spewing shocking insults on social media”. Senator Bernie Sanders, who lost to Hillary Clinton in their race for the Democratic presidential nomination, was quick to speak out against Bannon’s appointment. The Associated Press reported Wednesday night that Sanders described Bannon as “totally unacceptable”. He “called on Trump to pull back his recent appointment of a Breitbart News executive, as a top White House strategist”. Sanders know the position Trump has given Bannon does not require Senate approval, which means it is his decision to make. Trump’s choice for cabinet positions, like, Secretary of State, will require a Senate vote. Former New York Mayor Rudolph Guiliani has been mentioned for that role. Guiliani’s extensive financial international dealings with foreign governments should render his nomination highly unlikely. This is however, a highly unlikely presidency; the usual rules of politics no longer apply. The selection of “alt-right” champion Stephen Bannon as senior counselor, is just the beginning. The time for election mourning is over. The time for monitoring and resisting destructive appointments, must begin. As Gail Collins writes, “nine weeks and 3,998 appointments to go”. The picture above of Stephen Bannon is by Drew Angerer/ Getty, from The New Yorker. This entry was posted in Donald Trump, Stephen Brannon and tagged Stephen Brannon. Bookmark the permalink. As Trump’s supporters believe, “My country right or wrong”. Instead, we all should take the stance, “My country wrong needs my help”. I’m praying that soon, very soon, that others will take up this belief and oppose Trump before he does any damage to our national integrity. I think we are beyond the point of praying. The Hillariites have had their way. It is now time to take specific actions. Bernie (last night) laid out a whole list of things Trump promised during the campaigns. Bernie’s strategy is to take the things Trump said which are GOOD and to hold Trump’s feet to the fire to support his own promises. For example, Trump said he was in favor of spending $1 trillion on infrastructure. We need this. SO push Trump to get this ball rolling, providing needed repairs and jobs; don’t let him duck it. Trump will either do that which is good…or suffer the indignity of being clearly hypocritical (and remember, Trump DOES NOT suffer to be WRONG!). Suppose Trump pushes for something destructive. Insist that our weak-kneed Democratic Senators filibuster it until Trump backs off. Politics is NOT a spectator sport, as the Clintons or Trump would have us believe. The REAL work of politics now begin, after the angels have finished singing, after the shepherds have returned to their jobs, after the wise men and women have returned to their distant towers. It is time to stand at STANDING ROCK. It is time to be With our Islamic neighbors. It is time to be With LGBTQ pioneers. It is time to knock down the denigrating pawing of sexists and the slithering tongues of racists. It is time to rescue Mother Earth from the fossil fuel magnets and coal-breathing dragons. It is time to make music and be merry in these grey days!! Consider well the things YOU can do!!! !